I think I’ve mentioned before that I’m currently taking an online course called “What We Believe: Theology in the Anglican Tradition.” This week’s readings had us examining some issues that often become political in nature and we were asked to consider whether our theology plays a role in our politics. For me, I have trouble imagining how I could dissect my theology out of my politics! This really came home to me yesterday when I went to vote in the primary. My beliefs about God and God’s relationship with the world and God’s people (that’s all people, just to be clear) seem to be imbedded in who I am as a person – in the decisions I make and the actions I take. The big challenge I see is trying to consistently and faithfully live out my beliefs. And every other Sunday, we are able to reaffirm our faith with the words of the Nicene Creed or the Apostles’ Creed (in Morning Prayer). I like these reminders of my faith and the promises that I have made to live my life as a follower of Jesus. You’d think that maybe after all these years, I wouldn’t need to be reminded but my human nature can all-too-easily get the better of me if I’m not careful. I’m guessing that I’m not alone in this. God seeks to reconcile the world, so we speak of God mission, in which the Church and its members are partners and participants. God’s Mission has several aspects, and the complexity and expansiveness of the marks, mean that no one person, no single congregation or diocese, nor indeed any single part of the Church can completely or fully engage all the marks – it takes the Body of Christ to be god’s mission partner (from “5 Marks of Mission” by Katharine Jefferts Schori, published by forward Movement). If we combine our Baptismal Covenant with these Marks of Mission, we get a pretty clear mandate for how we should be living as members of the Jesus Movement and as vital members of the Body of Christ living out God’s mission for the world! Resolved, That dioceses and congregations adopt the practice of intentionally and publicly stating how each of their activities relates to the Five Marks of Mission. Welcome to the 2015 Ministry Fair: Re-Imagining the Household of God. 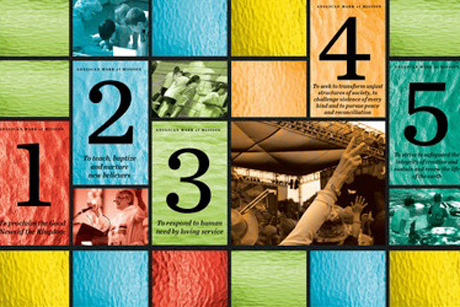 This year, we have again organized the Ministry Fair to reflect our diocesan commitment to the Five Marks of Mission as the way we live out our baptismal ministry as members of the household of God. The Five Marks of Mission, developed by the Anglican Consultative Council between 1984 and 1990, have won wide acceptance across the Anglican Communion, and have given congregations and dioceses around the world a practical and memorable “checklist” for mission activities. I hope that what you learn and experience at Ministry Fair 2015 will inspire and strengthen your commitment to live as a disciple of Jesus Christ and to participate in the Reign of God. As Bishop Gibbs said, the 5 Marks of Mission are a great measuring tool to assess how we are doing in serving God’s mission. This year’s Ministry Fair will give us another opportunity to check up on our progress. The story or image that is most central to the lives of Christians is about God’s overarching intent for all of creation – that it be a community of love, that acts in love and becomes more like the God we call Love. That means justice in society, peacemaking where there is strife, and living in ways that help to sustain the rest of creation. We call that God’s mission, and it’s quite clearly what Jesus understood his job to be. You can find this book for purchase at Amazon (http://www.amazon.com/gp/product/B00LH7ANXE/ref=dp-kindle-redirect?ie=UTF8&btkr=1 ) or the Episcopal Bookstore (https://www.episcopalbookstore.com/product.aspx?productid=8632 ). Let’s encourage one another to be the people God intends for us to be, the Body of Christ called to live out God’s mission to the world!